BATTLE CREEK, Mich., Jan. 25, 2019 /PRNewswire/ -- According to a recent Kellogg's survey conducted online by The Harris Poll, a majority of Americans say physical fitness is one of the most important factors for overall wellness (63%), compared to only 38% who say the same about digestive wellness. So in their new campaign for HI! Happy Inside cereal, launching today, Kellogg's is working with actress, New York Times bestselling author, and host of E! 's Busy Tonight, Busy Philipps to challenge Americans to take a #GutCheck and question whether they are supporting their digestive wellness. With prebiotics, probiotics and fiber, HI! Happy Inside is a new cereal that helps support gut health. "As someone who considers myself healthy by prioritizing fitness and following wellness trends, I'm so excited to partner with HI! Happy Inside, to remind people that being happy outside starts within," said Philipps. "HI! Happy Inside provides me with a tasty, convenient way to focus on my gut health, which has such an important role in my overall health." The "Gut Check" campaign will be encouraging people to take a #GutCheck and see how real food like HI! Happy Inside can help support one of 2019's biggest trends, digestive wellness. People located in NYC can also experience the launch through a pop-up gym at Kellogg's NYC on January 26 from 8-12pm to be one of the first consumers to get a free "Gut Check" trial of the product themselves. HI! Happy Inside was developed at WK Kellogg Institute for Food & Nutrition Research, a global community of food researchers, designers, and makers at Kellogg Company. Inspired by the legacy and values of its founder, WK Kellogg, the Kellogg Company has pioneered products that help support digestive wellness. Today more science exists to show that microbiome health is an important element for overall wellness. HI! Happy Inside is a digestive wellness brand delivering prebiotics, probiotics and fiber all in one cereal. The powerful 3-in-1 combination makes HI! Happy Inside a great option to support digestive wellness and a good start to your day, every day. Prebiotics: like chicory root fiber, feed certain good bacteria in your microbiome. HI! Happy Inside has 2.5 grams of prebiotics. Probiotics: live microorganisms that can provide health benefits. They are often called good or friendly bacteria. HI! Happy Inside delivers 1 billion CFU live probiotics. Fiber: your body can't break down fibers, but they help support digestive wellness and microflora diversity. HI! 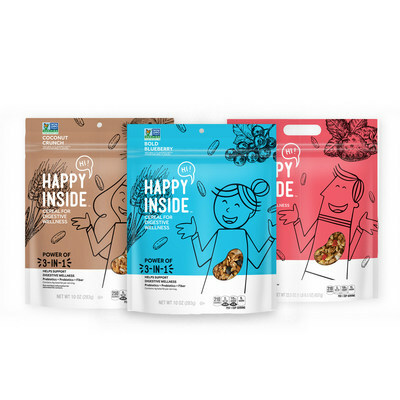 Happy Inside contains 8-9g of fiber depending on variety1. Premium, Real Ingredients: Features a delicious blend of wholesome fruit, yogurty pieces, and is made with 100% whole grain that stays crunchy in milk. Coming in Three Flavors: Available in three flavors, all naturally flavored with other natural flavors, Simply Strawberry, Bold Blueberry, and Coconut Crunch, supporting digestive wellness has never tasted so great. Take a gut check and see how real food like HI! Happy Inside can help support digestive wellness. Visit www.gethappyinside.com for more information and join the conversation on social media by tagging or engaging with @gethappyinside on Instagram, Twitter, and Facebook. This survey was conducted online within the United States by The Harris Poll on behalf of Kellogg from January 7-9, 2019 among 2,041 U.S. adults ages 18 and older. This online survey is not based on a probability sample and therefore no estimate of theoretical sampling error can be calculated. For complete survey methodology, including weighting variables and subgroup sample sizes, please contact Kathy Steinberg at kathy.steinberg@harrisinsights.com. At Kellogg Company (NYSE: K), we strive to enrich and delight the world through foods and brands that matter. Our beloved brands include Pringles®, Cheez-It®, Keebler®, Special K®, Kellogg's Frosted Flakes®, Pop-Tarts®, Kellogg's Corn Flakes®, Rice Krispies®, Eggo®, Mini-Wheats®, Kashi®, RXBAR® and more. Net sales in 2017 were approximately $13 billion, comprised principally of snacks and convenience foods like cereal and frozen foods. Kellogg brands are beloved in markets around the world. We are also a company with Heart & Soul, committed to creating three billion Better Days by 2025 through our Breakfasts for Better Days global purpose platform. To learn more, visit www.KelloggCompany.com or www.OpenforBreakfast.com and follow us on Twitter @KelloggCompany, YouTube and on our Social K corporate blog. 1HI! Happy Inside contains 4-8 g total fat per serving. See nutrition information for saturated fat content.